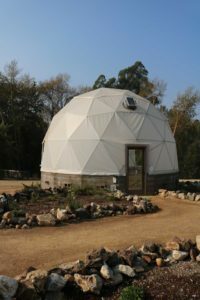 Tucked away in the UC Santa Cruz Arboretum are three geodesic domes housing 16 species of drought tolerant plants. The domes loom over the other gardens and act as a visual contrast to the landscape. This Institute of the Arts and Sciences exhibition, “Future Garden for the Central Coast of California,” focuses on the planting and continual study of these species. Pioneers in the ecological art movement, Newton Harrison and his late wife Helen Mayer Harrison envisioned “Future Garden” two years ago to uncover which plant species would be most resilient in the face of warmer temperatures. The Harrisons blended the artistic design of the domes with environmental sciences to explore creative solutions to climate change. The exhibition opened spring 2018 after a year of restoration, and is continually evolving. Martin Quigley, executive director of the arboretum, assisted in the garden’s creation and design. The domes house heat-adapted plants like coast buckwheat, lizard tail and foothill sage. Photo by Christina Bulosan. In spring, “Future Garden” plants began to grow. UCSC Arboretum scientists and botanists are now preparing to begin weather trials on the plants. They are waiting for the plants to mature enough to endure experiments through the winter. Arboretum student worker Andrew Zarzar tends to “Future Garden” on weekends. 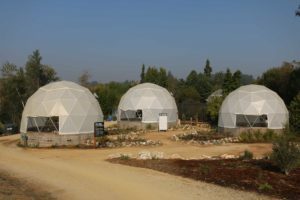 To mimic climate change, each dome has a temperature set 3 degrees Celsius higher than current weather pattern averages. Botanists and UCSC students planted the 16 species both randomly and in familiar groups. Between each dome, the water supply varies from heavy rain, to drought-like and variable rainfall. “The art and science combination is useful [because] it helps non-scientific people, and non-artistic people in a very visual way to see what weather change can do,” said Quigley, executive director of the arboretum. The 16 plants act as a base for other plants to grow upon. This growth would create a building block for the sustenance of other organisms like birds and insects. This step would further the Harrisons’ goal of creating an ecosystem able to survive and adapt as the climate changes. Each dome is three degrees warmer than current temperatures. Water conditions ranging from heavy rain to drought-like conditions. Photo by Christina Bulosan. Founding director of the Institute of Arts and Sciences John Weber and program curator Rachel Nelson contributed to “Future Garden” as curators and project managers. 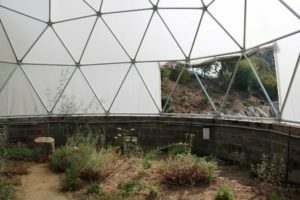 By providing programs and exhibitions like “Future Garden,” UCSC students can see the impact of climate change on local plants and have an opportunity to study climate change in an artistic way.